Between studies and social life, high school students have a lot on their plate. As a soon-to-be college student, the decision on where to go to college is one of the most important choices you have to make. 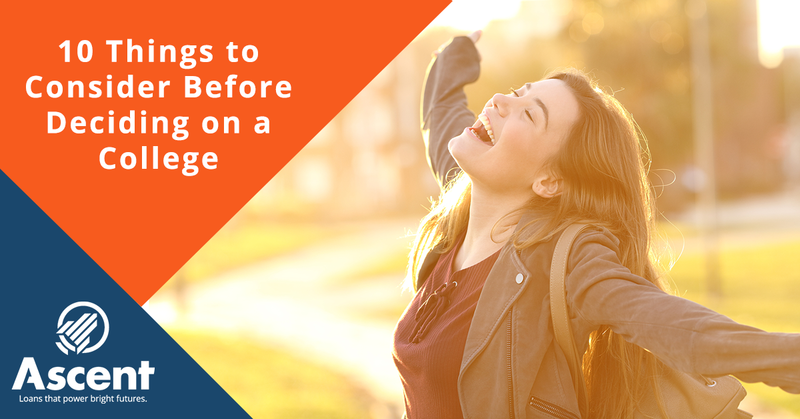 If you’re still on the fence about where to attend, worry not — here are 10 things to consider that will help you make the right decision when it comes to choosing a college. 1. Can this college take you where you want to go? The decision about what to study can be even more daunting than the question about where to study it. If you’re unsure, that’s OK — most colleges allow you to be undecided on your major until sophomore year. You may want to go with a college that offers a diversity of majors for you to pick. If you do have a particular path in mind, consider if the programs offered at the particular college are sufficient. Can this college take you where you want to go? Where a college is located can make all the difference. Are you someone who dreams of being near the beach, or do you prefer to play in the snow? Perhaps the weather doesn’t matter so much to you, as long as there is a thriving music scene or a few big cities within driving distance. Some students prefer to study close to where they grew up, while others would rather have a change of scenery. If you are uninspired by the area you’re in, it could be hard to stay enthusiastic about your studies. The surrounding area should be a place that offers you the opportunity to thrive academically, creatively and socially. Also, consider whether there are professional opportunities nearby, in case you want to stay after college. Overall, it’s important that you feel enthusiastic about living in the area. According to CollegeBoard, college prices have more than tripled over the last 30 years and continue to rise annually. It’s more important than ever to utilize student financial aid resources. Contact the college’s financial aid office to determine your eligibility for grants and scholarships that are offered — though they can be competitive, they can really pay off. Literally. Many students choose to take out student loans to help pay for tuition and living expenses. 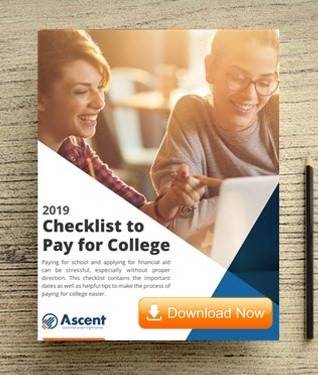 In this case, Ascent Student Loans can help make sure you have the resources to gear up for success. Often times, students do not factor in the cost of living, which can increase your total expenses significantly while you are attending college. 4. Does the campus life fit your lifestyle? There are many more aspects to the college experience than just classroom education – making friends, networking and having fun are important factors in staying well-rounded and avoiding burnout. Extracurricular activities such as athletics, student organizations and special interest clubs not only help balance out a busy study schedule but can provide an opportunity to learn leadership and networking skills. They are also a nice way to make new friends outside of the classroom. For many students, Greek life is a time-honored part of college. Getting into the right house offers a valued support network and can open many doors down the road after you graduate. If Greek life is important to you, be sure to check out the participation ratio. Some colleges have moved to completely eliminate Greek life altogether. See if you can get an idea of what your lifestyle might be like at the prospective college. Your primary focus should be getting the best education possible, but that doesn’t mean you can’t enjoy the process! 5. Does it have the right Class/College size for you to thrive? Some students prefer the more intimate and personalized setting of a small classroom, while others like the diversity of a larger class. Keep in mind that college size doesn’t always directly correspond to class size — there can often be small, niche courses in a large university. If you prefer a close-knit community where you have a chance to get to know everyone, a smaller college may be appropriate for you. Larger colleges and universities tend to have a wider variety of majors and a more diverse student body than smaller colleges. 6. Will the College Faculty get you set for success? A good professor can make all the difference between falling in love with a subject and just not connecting to the curriculum. Enthusiasm and passion are contagious — when professors really love their subject, it shows. If you can, meet a few of your potential professors to get an idea of what it might be like to study with them. Ask questions about the subjects you’re interested in and also about the school in general. Ideally, you can find professors that not only instruct you but inspire you as well. Websites like ratemyprofessors.com and koofers.com can help you learn more about the professors at the colleges you are considering. 7. Do the campus facilities provide the right environment for you? Are you someone who prefers to spend study time hunkered down in a quiet library, or do you find it easier to focus in the buzz of a busy café? Are cutting-edge laboratories or sports facilities important to you? When it’s time for a break, would you rather relax in a natural, outdoor setting or in a modern concrete jungle? Find a campus that plays to your needs both educationally and recreationally. You’ll invest a significant amount of time there, so it should feel like the right environment for you. 8. Are there employment and internship opportunities that align with your career goals? More than ever, employers are valuing hands-on experience when it comes to potential hires. An internship during your college years can make a big difference to future employers. Many colleges provide support systems to connect students with practical internship and employment opportunities — be sure to take advantage of these programs. Most college students wind up getting a part-time job to help supplement their monthly income or fulfill an internship requirement. Before you make your decision, research the job market and demographics. In some college towns, it might be more challenging to find a job or internship due to the population size and lack of available employment options. 9. Will your hard-earned credits count? Accreditation is a process of certifying that a college meets certain regional and national standards. Yes, even a college has to take tests of its own. Attending an accredited college helps to ensure that more of your credits would transfer, should you choose to attend another school in the future. There are two types of accreditation: regional and national. According to EDsmart, credits earned from regionally accredited institutions are generally more transferable than nationally accredited ones. An accredited college may also be seen as more reputable to future employers. Make all of your hard-earned credits count! 10. What are other students and alumni saying? No matter what a college might look like from the outside, an insider’s perspective is valuable in getting an idea of day-to-day student life. Communicate with current students and alumni alike. Inquire about workflow, majors, student life, professors and any other topics you are curious about. You’ll likely receive a range of feedback, and this will help you develop your own perspective and make a more informed choice. Even with all of these considerations in mind, it’s perfectly normal to still feel some apprehension about choosing a college. It’s a big decision. Though ultimately deciding which college to attend is your choice, you do have support. Financial help is available, and you can call on friends and family to get their feedback. Once you’ve made your pick, relax! Attending your choice college will mark the beginning of a new chapter, full of potential.